It's my participation in the contest run by @oracle-d about reviewing a finance dapp. To check all the finance dapps, visit Finance DApps by @stateofthedapps . I'm reviewing @fundition , the crowdfunding application built on steem blockchain. You can login there by using steemconnect.com , so it's safe to use. So, what's a crowdfunding platform anyway ? Crowdfunding is a support of a project to raise money from a lot of people. It's usually public, so anyone can donate any amount (s)he wants to support the founders. So, anyone will be able to raise funds if the idea is well appreciated. There are a few famous crowdfunding websites, like : Kickstarter.com , Indiegogo.com , GoFundMe.com and others. But they all are not on blockchain. Having a website like fundition.io , steem blockchain can enter the worldwide competitions and it will make it a very valuable asset in the international economy. On what fundition is built ? So, @fundition is built on collaboration, decentralization and gamification. Fundition allows founders to work as a team. Fundition removes the intermediate between a founder and a donator. Even with a small contribution a founder will be rewarded. The investor finds the best project to support, check the results, appreciate the creativity, fund the project and the founder takes actions to reach his goals. Superiority of fundition on other crowdfunding websites. If we take a look at all other crowdfunding platforms, we see them all taking fees from each project supported. But fundition doesn't take any fees thanks to the way steem blockchain is made. So, it's completely free to use. How exactly fundition works ? The principle is really clear and easy. A creator of a project comes up with a good idea. Contributes about it in fundition. Donators start donating using upvotes, donations can be in liquid steem or steem dollar, or even other cryptocurrencies are accepted like : Bitcoin, ethereum, litecoin, bitcoin cash, monero, bitshares, dash coin, dogecoin or tron coin. Fundition accepts even paypal. Then the founder makes updates about his project to show the progress to investors. When the project is completely funded, it may even reward the investors with nice gifts. Fundition is heard based on an initiative that works with proof of merit and it's one of the best applications on steem blockchain and even tron. @fundition account now has more than 1 million steem power, which allows it to give an upvote up to $25. How to create a project on fundition ? 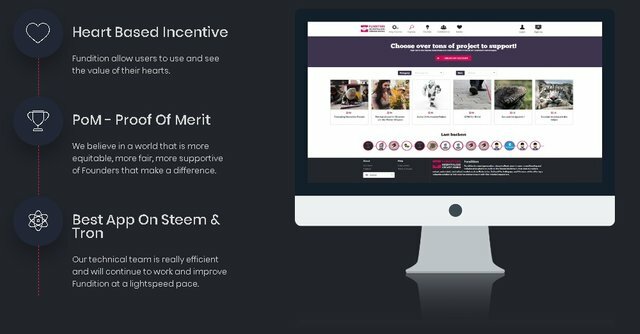 When the project is done, it will be automatically shared on your steemit page. Investors in fundition will also notice it and if it catches their attention, they will start funding it. You can also share the page created in all social networks and you may even find investors from outsitde steem and that's awesome. The role of fundition is to facilitate to projects in finding investors. I wish they could help as well with promoting the projects and that's the only criticism I have. Today @fundition team are celebrating one year of great work. A lot of projects were funded and almost $100k were distributed between almost 300 projects. The project is growing fast and improving day by day. Let's wish them all the best for empowering so many ideas on our blockchain. Please resteem to promote such an awesome application to the world. For any questions join : Fundition discord server. Not to miss any contest of @oracle-d, follow them and follow @oracle-d.tasks and @dapplovers.